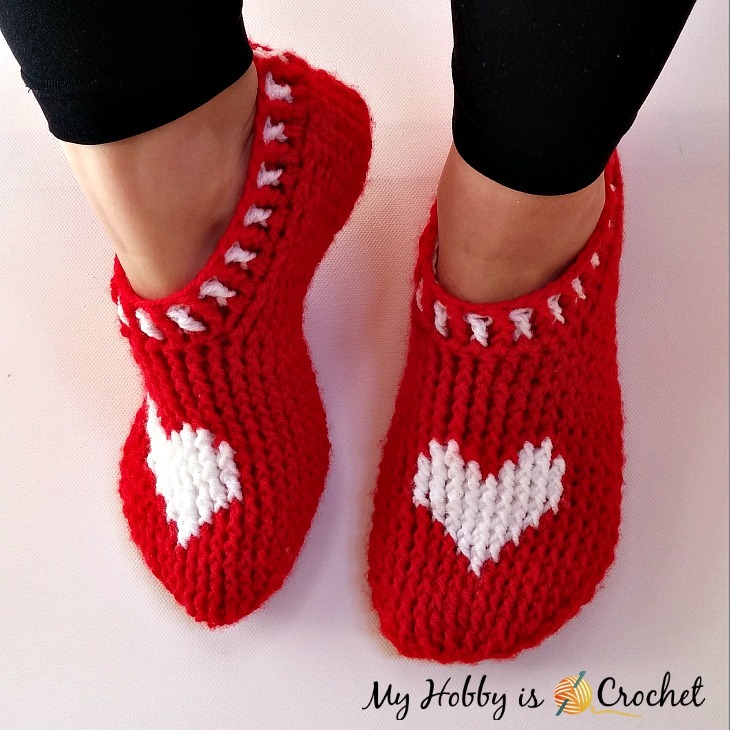 These pretty and cozy heart slippers are crocheted using post stitches, that create a thick and warm knit-look texture. They are quick and easy to work up; you can crochet them up in a couple of hours. This pattern could become your ‘go-to’ slipper pattern! 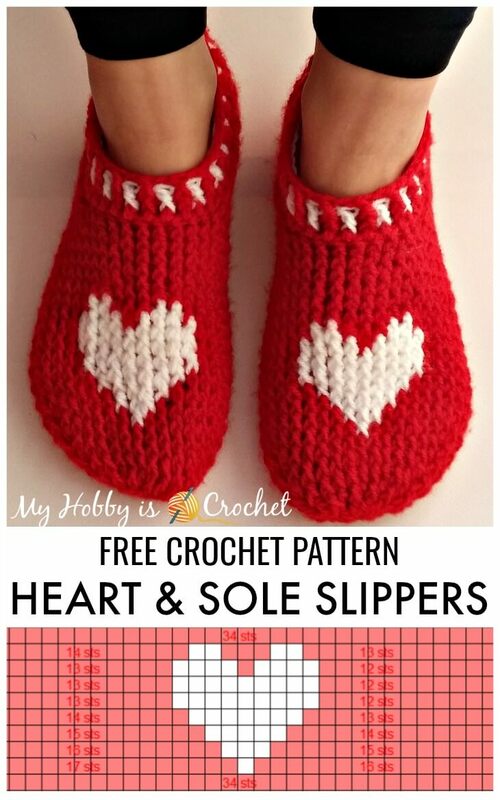 The Heart & Sole Slippers is my second Valentine's Day inspired pattern using a heart graph. The first one was "A Hat with Love", a cute hat with hearts going around. Please check your gauge and also try the slippers on while working. For larger sizes work more rounds and rows. For wider and longer slippers, you could try using a thicker yarn and larger hook size. Small Child Size of the slippers available HERE! - 2 skeins of DK / 8 ply yarn in red (color A) and small amount of white (color B). I have used Red Heart Lisa (available in Europe), but you can replace it with other yarn having the same weight, for example Red Heart Comfort Sport Yarn available in the US. standing hdc: See this Tutorial on Moogly blog! bpdc2tog inv= invisible decrease back post double crochet= yo and insert hook from the back to the front around the post of the next 2 sts (at the same time) on the previous row. Complete as for regular dc. See this Video Tutorial by Woolpedia on YouTube! It's for the front post decrease but you can see how to insert the hook around 2 stitches. Do in the same manner for the back post decrease inserting the hook from back to front around the post of 2 sts. How to change colors: work the last st before changing colors till half, having 2 loops on hook, pick CC yarn and end the stitch, pulling CC yarn through the 2 loops on hook. Do not not cut yarns when changing colors, you can choose to work around the yarn not in use, or you can carry the unworked yarns across the back. Keep the tension of the strands not in use a little loose, to maintain elasticity. To avoid long floats of yarn, you need to catch the yarn not in use. Watch the Video Tutorial from Bobwilson123 for the Hat with Love to learn how to do that. Round 6: ch2, with A 1fpdc in each of next 16 sts, changing to B at last st, with B 1fpdc around next stitch changing to A when the st it's made till half; continue with A and work 1fpdc around each of next 17 sts, sl st to top of first fpdc. Round 7: With A ch2, work 1fpdc around each of next 15 sts, changing to B at last st; with B 1fpdc around each of next 3 sts changing to A at last st, continue with A and work 1fpdc around each of next 16 sts, sl st to top of first fpdc. Round 8: With A ch2, work 1fpdc around each of next 14 sts, changing to B at last st; with B 1fpdc around each of next 5 sts changing to A at last st, continue with A and work 1fpdc around each of next 15 sts, sl st to top of first fpdc. Round 9: With A ch2, work 1fpdc around each of next 13 sts, changing to B at last st; with B 1fpdc around each of next 7 sts changing to A at last st, continue with A and work 1fpdc around each of next 14 sts, sl st to top of first fpdc. Rounds 10-11: With A ch2, work 1 fpdc around each of next 12 sts, changing to B at last st; with B 1 fpdc around each of next 9 sts changing to A at last st, continue with A and work 1 fpdc around each of next 13 sts, sl st to top of first fpdc. Round 12: With A work 1 fpdc around each of next 12 sts, changing to B at last st; with B 1 fpdc around each of next 4 sts changing to A at last st, with A work 1 fpdc till half, change to B and finish the st with B; continues with B, work 1 fpdc around each of next 4 sts changing to A at last st, with A work 1 fpdc around each of next 13 sts, sl st to top of first fpdc. Round 13: With A ch2, work 1 fpdc around each of next 13 sts, changing to B at last st; with B 1 fpdc around each of next 2 sts changing to A at last st, with A work 1 fpdc around each of next 3 sts, change to B at last st, with B 1 fpdc around each of next 2 sts changing to A at last st, with A work 1 fpdc around each of next 14 sts, sl st to top of first fpdc. Cut yarn B. How to read the chart: begin reading the chart from bottom to top, from right to left. The top row in the chart stands for round 5 in the written instructions and the bottom row in the chart stands for round 14. The numbers at the right and the left of the heart are the number of stitches in color A (as written in the instructions above). Rounds 14: With A work 34 fpdc around, sl st to top of first fpdc. Rounds 15- 18: Repeat as round 14. Note: It will be much easier to count the rounds/ rows on the wrong side. Count the ridges on the wrong side and write down to make the same for the second slipper. ( At the end of round 18 you will have 17 ridges on the wrong side.) For larger slippers, continue until the desired length. Note: ch 2 at beg of rows will count from now on as a hdc. Left foot: Holding the piece with the back seam facing you, count 13 sts from the back seam to the right and join yarn with a standing hdc into the 13th st. Continue to work row 1. Next row: ch2, 1fpdc around each of next 22 sts, 1 hdc in top of ch2. (24 sts). Turn piece on the wrong side. Ch1, join at heel the sides together, sl stitching through both top loops of each side. Don't fasten off! Slip stitch back to top. Ch 1 and turn piece on the right side again. Round 1: Work a minimum of 36 hdc evenly spaced around the foot opening, sl st to top of first st. (36 sts) For a larger opening work more as 36 sts, but the total number should be a multiple of 2! Round 2: ch3, sk 1 st, *1 fpdc around next st, ch1, sk 1 st*, repeat around from * to *, sl st with B to top of first fpdc. Round 3: with B ch2, 1 fpdc around first skipped hdc 2 rounds below, ch1, sk next fpdc, *1 fpdc around next skipped hdc 2 rounds below, ch1, sk next fpdc*, repeat from * to * around, sl st with A to top of first fpdc. Round 4: with A ch2, 1fpdc around first skipped fpdc 2 rounds below, ch1, sk next fpdc, *1 fpdc around next skipped fpdc 2 rounds below, ch1, sk next fpdc*, repeat from * to * around, at the last repeat don't ch 1 anymore before slip stitching to top of first fpdc. 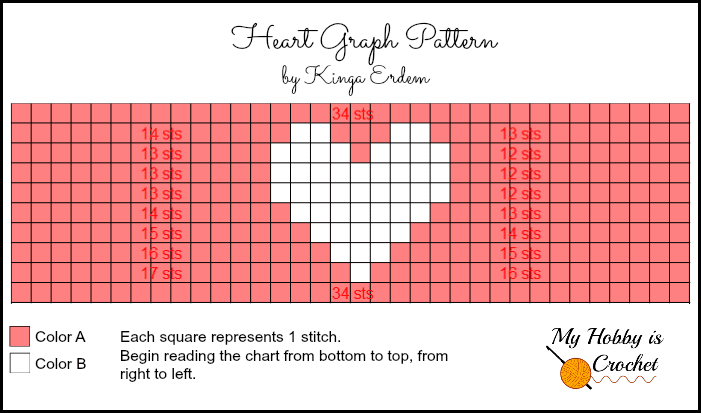 I hope you will enjoy this pattern! I love the heart slippers pattern. I wish you had a pattern like it with a shamrock for St. Patricks Day and a bunny for easter.